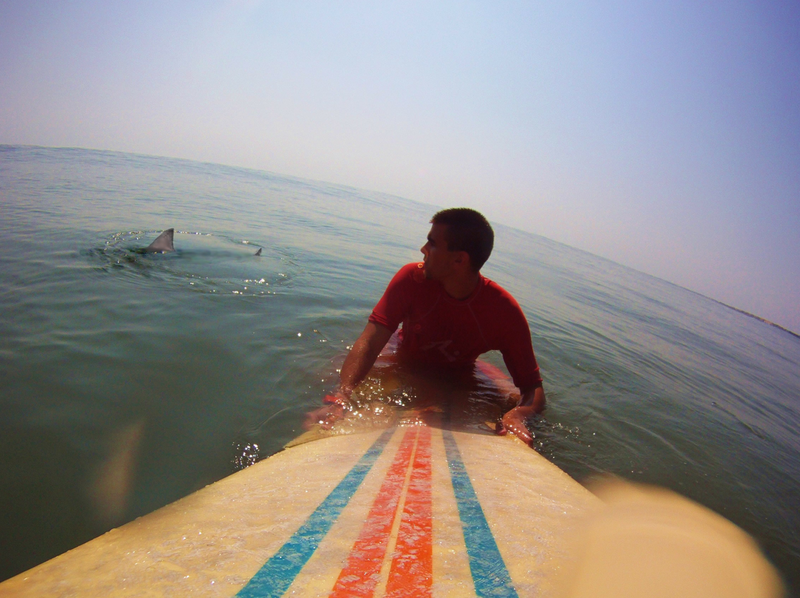 Shark Wants To Be In This Surfer’s Shot, Too! Wow! Check out this photo that local Chase Nawrocki of St. Augustine, FL, captured earlier this week while out surfing with his deck-mounted GoPro camera. That guy in the background is just a little too close (and too big) for comfort! Out in the water, there are often times when we surfers wonder what might be over our shoulders. Now, we know! Thanks to Chase and the Surf Station for sharing this. On the 10th anniversary of 9/11, the NFL paid a magnificent tribute to this life-changing event in American History. There were many beautiful rememberances held over the course of the weekend, but it is not surprising that the NFL delivered one of the finest. Almost everything they do is first class, run by some smart folks. As good as the entire ceremony was, I posted this video for one very specific reason: the EPIC performance of our national anthem, The Star Spangled Banner by tenor Jim Corneilson. You have to watch it. You won’t believe it. 2) He not only DELIVERED it, he did so with EVERY OUNCE of PASSION and ENERGY he had in his body. 3) And finally, HE ROSE to the occasion under the most extreme pressure. Consider that this was the opening of the NFL season. Consider that the event was being simulcast from Soldier Field in Chicago to every other stadium in America and hundreds of millions of homes around the world. Consider the miilions of eyes and cameras that were upon him precisely at this most poignant moment, on this most profound day in our history. I love it when people respond in moments like these. I challenge you to watch this stirring video and not be moved. One day, I am going to start a website called www.risetothechallenge.com that features nothing but short clips contributed by anyone, of moments like these (defining moments of great achievement under the greatest of pressures). They are most commonly identified with every variety of sports, but happen in all types of arenas from performing arts to local spelling bees. They are wonderful moments in life that lift and inspire us; remind us how remarkable the human spirit is; and how miraculously we are made. 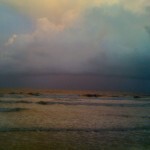 I walked over to the beach on Thursday evening, August 25th, 2011, as Hurricane Irene was edging nearer to the Florida Coast. The clouds and light were going off, so I snapped a few shots with my iPhone (check out the first perfectly curved outer bands that started to show in shot #3!) 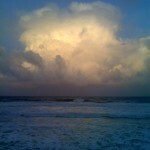 I spent the greater part of the next two days surfing my brains out, a rare 8-10 ft. Friday, 3-5 ft. Saturday. It’s Sunday now and I’m hurtin’. Supposedly, there’s another pulse coming later this week (Jose?). I appreciate Florida’s great sunsets and the tropical waves we wait for in Summer, but the searing heat of July-September here, I could do without! Overall, I wouldn’t trade living in Florida for anywhere else! As almost any parent will attest, there are many moments in life when our children make us proud. But there are some moments that are better than all of those, combined. They are typically more subtle in nature and can rarely be anticipated. They are fleeting moments of revelation that provide us genuine clarity about who our children really are, and if we are so fortunate, perhaps also a little affirmation about the real jobs we’re doing as parents. I enjoyed one of these moments just the other night. Our family had huddled together in bed to watch “Soul Surfer“, the movie about Hawaiian surfer Bethany Hamilton who lost her arm at age 13, to a 14-foot Tiger Shark. 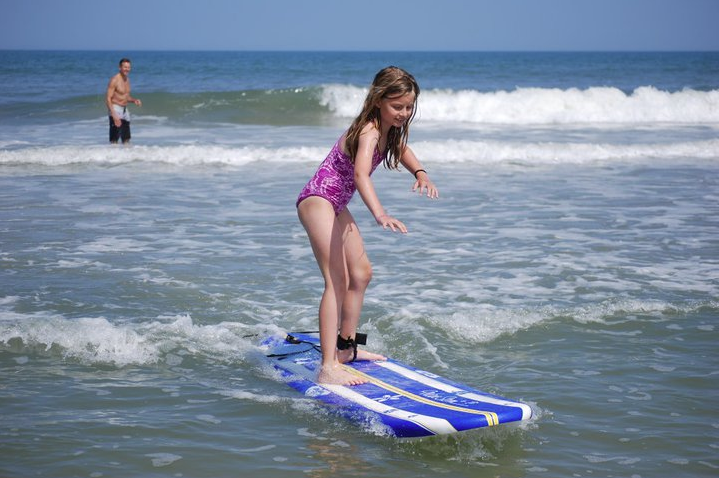 Somehow, she not only lived to tell about it, but learned to surf again with one arm. It’s a great story about faith, determination and never giving up. I highly recommend it. There’s a scene in the movie, when, after deciding to try and compete again and struggling bravely against rough currents with one arm during a surf contest, a frustrated and emotionally defeated Bethany heads to the parking lot post heat, ready to give up surfing for good. As she sulks back to her parents car, two young fans, about 10 or 11 years old, approach her for an autograph. Dejected, Bethany quips, “Here’s something better…” and proceeds to give both of her surfboards to the girls, who delight in their good fortune, and run away excitedly to show off their new souvenirs to their friends. Eventually, Bethany makes up her mind that nothing is going to stop her from surfing again, training herself to duck dive with one arm, then returning to competition. I won’t spoil the ending, but will say that both of my girls, ages 9 and 12, really loved the movie. Later that evening, I was lying in bed with my (newly) 9-year-old, Kaelyn, putting her down for the night. The movie had clearly affected her in different ways and she seemed to want to talk about, and process it. And of course, Kaelyn didn’t have to explain it to me further. I knew exactly why she wouldn’t take it. It’s called “empathy” and “compassion” (coincidentally, an important secondary theme in Soul Surfer) and it so warmed me to see it in her that instant, on display in such a simple, honest way. I can’t think of many times as a parent when I’ve felt so proud of her. To me, and I would guess for many parents, it’s little moments like these that really leave their impressions. So much more significant than than winning a trophy, ribbon or a medal. So much more substantive than good looks or even bringing home a good grade. So much more profound and revealing…. About who our children really are. About the efforts we’re putting into raising them. OK, at 5,234,888 views you’ve probably seen this one. Poor quality, but spectacular content. Classic. I just love it. I was never much of skateboarder. A lot of athletes can do both. However, ideally, you learn to skate before you learn to surf. I believe it easier to translate skating skills to surfing, than the other way ’round. learned to surf before I learned to skate and could never pull that surfing style (with big carving turns) out of my system, which you’ve got to be able to do for skateboarding, at least on ramps. I did get into street skating for a time, but never anything like you see here. Another thing I like about this video is the Ten Years After tune. Great music choice. Nice editing. Enjoy! So, I haven’t posted too much since late last year: I’ve been busy, busy, busy at work! That hasn’t changed at all since I first started this blog. In fact, things are just continuing to pick up- lots of exciting things happening at work! Due to this, I’m not putting a lot of pressure on myself to keep up with my personal blog. However, I still want to try and post up some new content now and then, when something catches my eye. This weekend, while trolling the message board of one one of my favorite local surf shops- The Surf Station in St. Augustine, Florida, I came across this video showcasing 9 minutes of pumping surf in Mundaka, Spain. Now, I’m a third generation Florida native- not much of a cold water guy in the least, but I am a goofyfoot and these relentless barrels and walls just look too fun! The video comes from a pretty neat website called DailySurfVideos.com. You can subscribe via their RSS and get new vids emailed to you daily (or sent to you on FB or Twitter). Now, sit back and enjoy this hypnotic session! A friend of mine just shared this winning video of Matt Meola from the much-heralded Innersection.tv contest and I, in turn, am sharing it here with you. This spot was filmed and directed by Elliot Leboe of ACL Digital Cinema. Beautiful work, amazing surfing. Mindblowing. 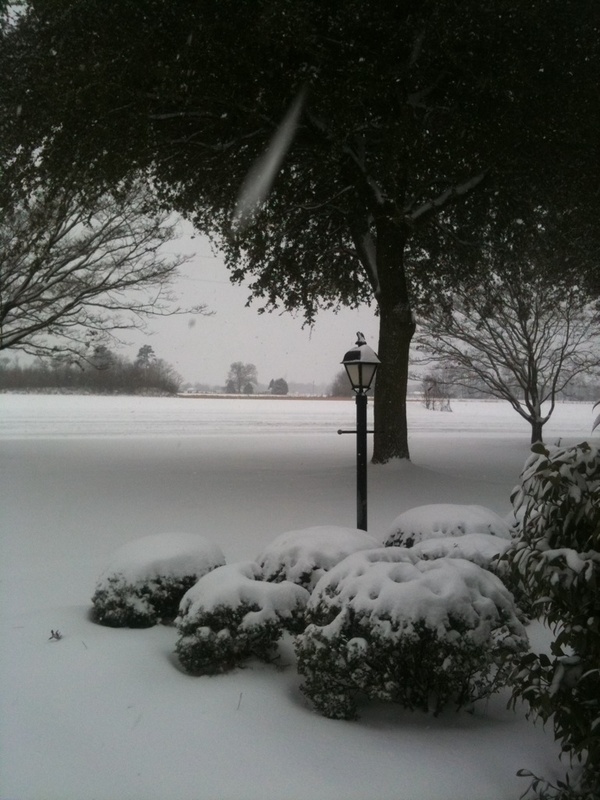 A mesmerizing shot of the beautiful, virgin white snow that arrived in Hartsville, South Carolina on Monday, January 10th. The fresh and somewhat rare 6″ of powdery goodness was part of large storm system blanketing parts of the northeast and south. My mother-in-law, Tracy Chapman sent this while visiting Nana up on the farm. Note: Florida was the only state in the nation that did not receive snow from this storm. All 49 other states got in on the action, including Hawaii that had snow fall on Mauna Kea on the Big Island. People who know me will tell you that there are two very distinct sides to me. On one hand, I’m inherently shy and a little self-conscious. I need to warm up in most social situations and may initially come across as quiet, or aloof. On the other hand, once the ice is broken, I’m actually pretty sociable. Perhaps that’s why I enjoy things like blogging and social networking. Another characteristic that I’d reckon defines me is that I’ve always been a bit of a risk taker. I have an adventurous spirit and have never let fear of failure prevent me from pursuing any goal or interest. In doing so, I’ve discovered that more often than not, taking chances in life have always yielded the greatest rewards. At the very least, doing so has always made my life interesting. 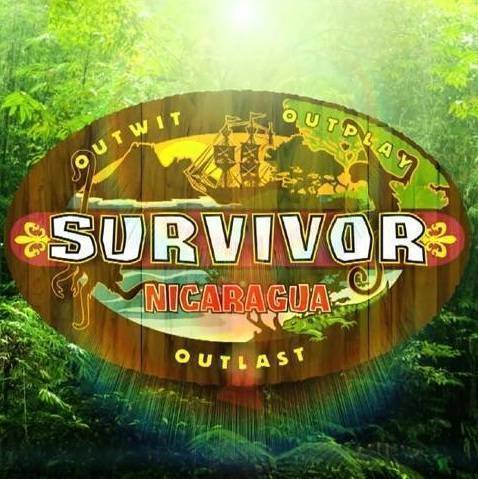 So, while not all of my friends knew about it, it probably wouldn’t surprise any of them to learn that a few years ago, I applied to play the reality show “Survivor”, and was subsequently called to a formal audition in Miami. I don’t watch a lot of tv, but there’s no denying that I’m a Survivor addict. It is my wife and I’s favorite show and we’ve only ever missed a handful of episodes. I’m intrigued with every element of it– the adventure; the physical and emotional challenges; the human psychological and relational aspects; and the pure athletic competition. I’m a hyper-competitive person by nature. And I’ve always felt I could win the game, given an opportunity. One day, I read in the Florida Times-Union that they were holding auditions for Survivor at a local Krystal restaurant. The article said that everyone who wanted to be play the game would be given 30 seconds of camera time to explain why they should be allowed to. I mentioned this to my wife, Gretchen, who then astutely pointed out that if I applied through the normal online process, I could submit up to a 3:00 minute tape, providing me far more time to persuade, and have the ability to be more creative. So, I came up with a concept and with a little help from my daughters and Gretchen behind the camera, we filmed an audition tape in our back yard, and across the street at the beach. Now applying for Survivor is not an easy process, but many thousands of people do it. Ultimately, only a few make it onto the show. In addition to making a video, you must fill out a HUGE stack of paperwork (now it is all done online, which wasn’t the case when I applied), that includes everything from questions about why you want to play the game and how you would play it to educational records; employment records; court records; and medical records. It was actually a good exercise because it forced me to pull my life history all together in one place, which took a fair amount of effort and detective work. After completing my paperwork, I sent in my package for the upcoming season via Fedex on the last day that they were accepting applications for the show. An eternal optimist, I thought I had a fair shot, but was still surprised when a casting director for the program called about a week later and invited me to the audition in Miami. The Times-Union had reported that out of the throngs of people who had auditioned at the Krystal tryout, only one other person had been given a similar opportunity. Most exciting of all, before I hung up the phone, the casting director said to me: “Tim, I just want you to know- you have a really good chance of getting on the show.” Needless to say, I was stoked! The casting director then informed me that she would be sending me additional paperwork that included more medical forms, which I was to complete with Doctor sign-offs and bring with me to the audition. She told me to dress normal, be myself and said that if I made it, I would be sent to Los Angeles for another audition with about 50 finalists, from which they would select that season’s players. I was instructed to not to tell anyone anything about the audition, (which I didn’t for 4 years, thereafter). When I went to Miami, I met with several casting directors working for the show. There were also a couple of other people there who were auditioning, like me. I met my contact and she took me to a room where I was interviewed on camera. I won’t go into specifics because I intend to try out again one day and will respect the privacy of their process. I had been playing a lot of flag football in a men’s Over-30 league and had herniated a couple of discs in my lower back, one of which had become an increasing problem throughout the preceding year. In the months and weeks leading up to the audition, I had tried just about everything imaginable to help it including physical therapy, Vax D, Cortizone shots– you name it.When I went to get the medical forms signed by my Doctors to bring with me to the audition, well- this all had to be revealed. After handing over my paperwork to the casting director just as I was leaving the audition, I felt I had to address the subject, because I knew that she was going to see the reports and be alarmed. I informed the lady that she would see in my package where I had been having some, “minor back issues”, but that I was feeling “much better” and had gotten past these problems. Well, as soon as I mentioned this, her smile turned into a frown and a serious look of disappointment! She told me straight up right there that this was likely going to cause a problem with the producers because people with medical issues –especially back issues– were not looked upon favorably, due to the extremely physical nature of the game (including, she said, simply sleeping on the ground. Not good for people with bad backs.). This, along with the high costs of potentially “losing” competitors prematurely during the competition (which is why, if you have ever noticed, show Host and Producer Jeff Probst hates it when otherwise healthy competitors actually quit the show, mid-contest), make the producers extra careful. Nonetheless, I reassured the casting director that I was extremely fit and could endure any potential discomfort. But, unfortunately, my paperwork indicated that there was a clear problem. My pitch hadn’t worked… It was over right there in the hallway, and I knew it. About 2 weeks later, I received an official “Dear John” letter from Mark Burnett Productions in Los Angeles. I called the casting director in Miami and she said that she couldn’t speak for why they make any particular decisions, but that yes, my health was almost certainly a concern. She encouraged me to reapply at a later date, and noted that this (applying more than once), was a way that a number of people ultimately make it onto the show. While I was extremely disappointed, my not making it turned out to be a blessing in disguise. Very shortly after the audition, my back worsened severely, and I found myself limping into a hospital for surgery. There’s no way I could have played the game that season. Since that time, life took over and I haven’t made it back to reapply. At the same time, my back has healed (surgically corrected, now) and I do plan to go for it again one day! Until then, here’s the video that caught Survivor’s attention the first time. I scripted it. Gretchen filmed it. And Mitch Kauffman over at Atlantic Video Productions did a great job of editing and pulling it all together for us. Hope you enjoy it! I first came across this music video about two years ago and it has since become one of my favorites of all time. It is a cover of “Stand By Me”, the Ben E. King classic (one of the greatest songs ever written in my opinion), from the award-winning documentary, “Playing For Change: Peace Through Music”. The Playing for Change project is the brainstorm of Mark Johnson and Playing for Change Foundation Executive Director, Whitney Kroenke. Mark’s idea was to travel around the United States with a mobile recording studio and capture musical moments from street performers across America. As Johnson and Kroenke traveled, they realized how extraordinary it would be connect all of those talented musicians to one another. They came up with the idea of starting a song in one location, then taking the partially completed song and the recording studio on to the next musician, until the song was complete. Through this process, they discovered how music transcends cultural barriers. As they continued to travel, it became apparent that their project was much bigger than any one country and so they decided to continue around the world, meeting and recording new musicians internationally, and continuing to grow their songs along the way. Since its introduction, Playing for Change has received international acclaim from New York to Africa, to Brazil, to India and beyond. The street performers in their videos have appeared on shows like The Tonight Show and they’ve raised many thousands of dollars for instruments, musical schools and programs benefitting students in locations around the globe. Most recently, Yoko Ono assisted by supporting Playing for Change with the recording of the song, “Imagine” that also included video of John Lennon himself. Sign up at www.playingforchange.com or www.playingforchange.org for updates, exclusive content and to join the movement to help build schools, connect students and inspire communities in need through music. You’ll also find the full library of music videos for Playing for Change which you can purchase on DVD. Make sure to check out another one of my favorites, “Don’t Worry”. Fantasy Surfer: Oh So Close to the Grand Prize! I’m a big fan of professional surfing and follow the ASP World Tour pretty closely each year. I love to watch the world’s best surfers on the world’s best waves and end up watching most of the contests online. A few years ago, Action Sports Group, the media company behind Surfer, Surfing, Snowboarder, Powder, Bike, Skateboarder and several other great media titles, started an online fantasy surf league called Fantasysurfer.com. The object of Fantasy Surfer is to utilize a $50 million payroll to build a team of 8 surfers for each contest, choosing from the 40 -50 entrants for each World Tour event. I’ve done pretty well each year that I’ve played and don’t think I’ve ever finished below the top 90% of all players. This year, I almost won the thing. Check out the stats from my team’s (Rightcoastrules) screenshot from the final event, the Pipeline Masters in Hawaii, which commenced on Dec. 16th, 2010. There were 94,199 total registered users, most of whom dropped out at some point during the year. There were 16,866 active users who actively played all year for the title. I came in 195th. That’s the top 99.99% of all active players! Johnny Correll, a surfer and IT administrator from Virginia Beach was this year’s winner. The Grand Prize that I almost won that Johnny will now be enjoying was a nine day trip for two to the Nemberala Beach Resort in Indonesia with all expenses paid! Dammmmmmmmmm youuuuuuuuuuuuu Johnnnnnnnnyyyyyyyyyyyy!!!!!!!!!!!!!!!!!!!!!!!!!!!!!!!!!!! There, I feel better. An interesting note: Take a look at my last team lineup to see an example of my maddening mix of brilliance and careless oversight. As you can see, I had actually selected the event’s eventual winner, France’s Jeremy Flores. I doubt there were many who made this same call. Jeremy is a solid mid-level guy, really skilled in most kinds of surf, though not exactly known for his big wave surfing in Hawaii. On the other hand, you can see that I also had Andy Irons on my team. As most in the surf world know, Andy had passed away tragically from a serious illness just weeks earlier. In fact, the entire event was dedicated to his memory. I still had $2 million available to pick up one surfer, which generally affords you a wild card entry, usually a local talent from the area that is hosting the event. In Hawaii, the wildcards are usually pretty good and legitimated threats. I had been using Andy as a placeholder on my team as a sort of tribute to him, and had intended to scout the available wildcards prior to the event’s start and select one in place of Andy. As it happened, I got very busy and then sick myself, and ultimately the contest began with my not making an alternate selection there and leaving $2 million sitting on the table that could have been put to great use by either selecting a wildcard or upgrading one of the other surfers. There’s no certainty as to what that might have done for my event and overall scores, but leaving it the way it was certainly didn’t help. Have fun in Indo, Johnny. 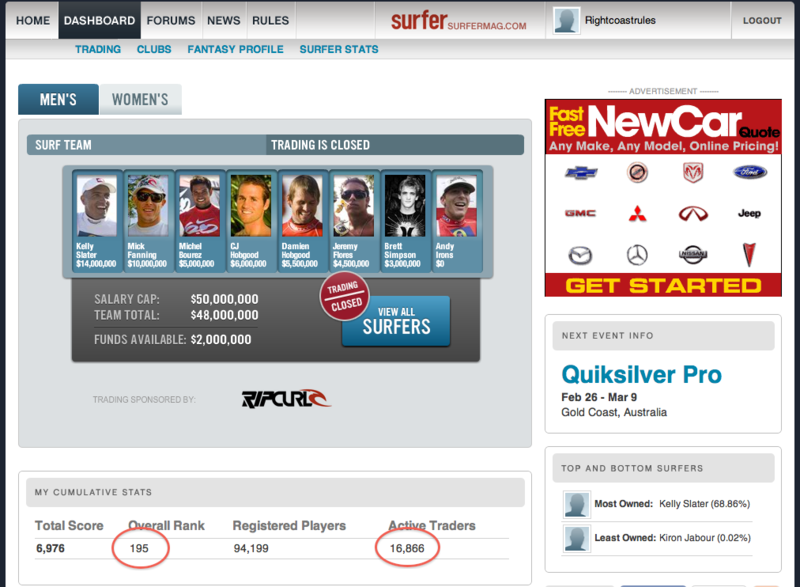 The next round of fantasysurfer starts in 60 days and I intend to win it. This is a really nice video tribute to 3x World Champion surfer, Andy Irons, who passed away on November 2nd of this year at the age of 32. Andy died alone in a Dallas hotel room, during a layover while en route from a professional surfing event that he had withdrawn from in Puerto Rico, to his home in Kauai, Hawaii. He reportedly had been battling with Dengue Fever, a viral disease that had left him too sick to travel further. 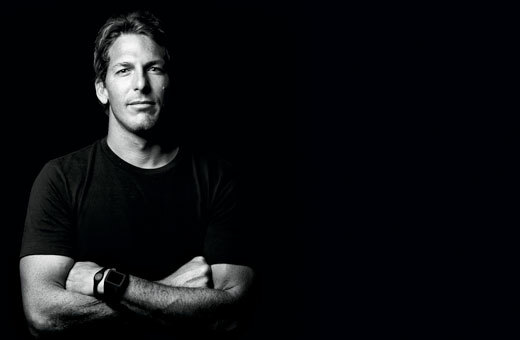 Like many others in the surf world, I was shocked and deeply saddened by this stunning loss. Andy was a first time father-to-be. His wife Lyndie has since given birth to their healthy son. The qualities I admired most about Irons aside from his incredible surfing were his fierce competitiveness, raw energy and passionate personality. He wore his emotions clearly on his sleeve, so you always had a good idea about what he was feeling at any given moment, whether that was euphoria after a heat victory or anger and frustration following a defeat. He was the only surfer to legitimately challenge the supremacy of Kelly Slater during his 15 year reign, winning three titles in row from him from 2002-2004. He did it with fearless surfing that was an exciting mix of power and finesse; that often seemed out-of-control, when it was anything but. He excelled in all types of surf and was equally adept above the lip and inside the largest pits. There’s a great line in this video by former World Champ, Mark Occhilupo, who summarized Irons’ surfing style as, “like a cat on acid”. That’s incredibly accurate. The end of the video is pretty powerful as several of Andy’s close friends and family (including his brother, Bruce), try to make sense of this tragedy and express what his loss means to them and the rest surfing world. Clearly, a lot more time is going to have to pass before anyone can really say, if ever. R.I.P. Andy and prayers to your family and friends. Here’s another image I created utilizing the Focal Lab iPhone app, this time an image of my oldest daughter, Kendall. The original shot was taken by my wife on a farm in South Carolina using a Nikon DX 40. I then used my iPhone to apply a mix of selective soft focus, dreamy focus and motion focus to achieve this effect. There’s probably over 3,000 or so photography apps in the iPhone store, not all of them created equal. Focal Lab is a nice one created by Nexvio, a company that specializes in innovative photo and video applications for mobile platforms. Think of Focal Lab as a kind of a Photoshop Lite. It allows you to utilize selective focus in your shots. Unlike other soft focus / blur apps, Focal Lab allows you to create graduated blurs surrounding an in-focus area. 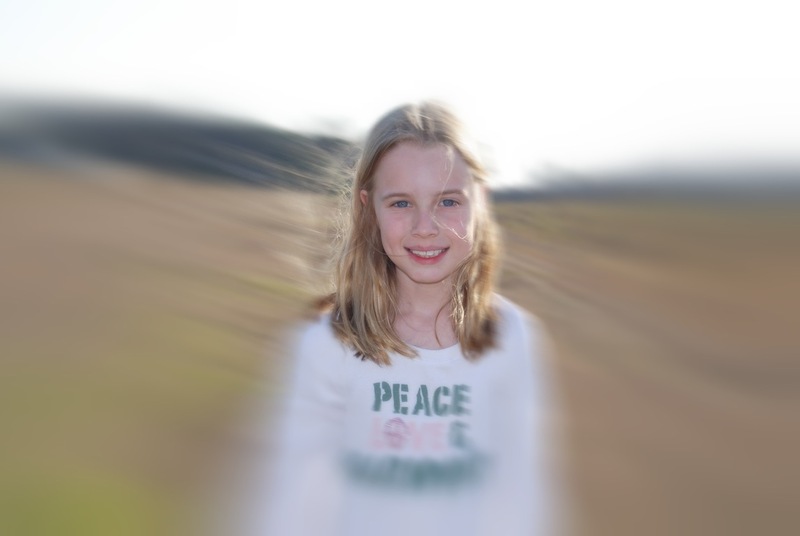 You can select (and move) the area you want to keep in focus, while blurring everything around it. Here’s an image of my daughter Kaelyn that I created in about 15 seconds (originally shot on my iPhone). For only .99 in the iPhone Apps store, you can go from a hack to a pro with just a few slides of your thumb. Nexvio also has some pretty cool looking video apps, including 8mm effects and a time lapse video creator that works by stringing together stills on an iPhone 3G and 3GS! Earlier this week, Urban Meyer announced his resignation from the Florida Gators after compiling a 64-15 record in six seasons at Florida. His notification comes on the heels of an underwhelming 7-5 season, his worst as a head coach; one that ended on a low note in Tallahassee with an offense in complete disarray. You might be tempted to call Meyer’s walking away with a major overhaul in front of him cowardly or irresponsible, or question his heart and character. However, I would suggest that his act was courageous and profound, wholly accountable and without remonstrance. 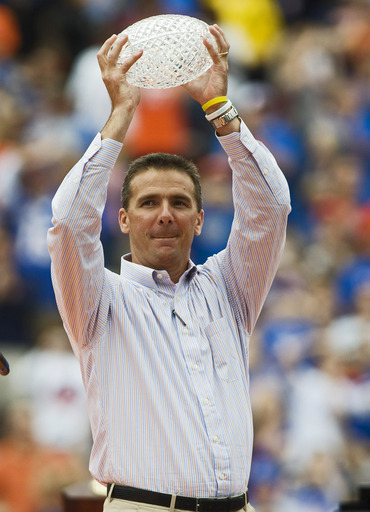 You see at age 46, with three national championships under his belt, one year removed from serious health issues and with a wife and three children who saw far too little of him, Meyer finally realized that the sacrifices he was having to make to enjoy this level of success were far more significant than another crystal trophy, and their consequences more imperishable. Meyer, who has two college-aged daughters and a 12-year-old son said, “I’ve not seen my two girls play high school sports”. “They’re both very talented Division I-A volleyball players, so I missed those four years. I can’t get that time back”. And if he didn’t get to see much of them the last four years, what makes you think the six before that were any different? Or the ten before that? So Urban quit his job as coach for the Florida Gators for the sake of his family to become a better husband and father. I believe this reveals far more about heart and character than this year’s recruiting haul, any improvement he might have been able to engineer next season or any future championships he might have been able to win. Ask almost any extraordinarily successful man or woman about achieving uncommon success and I bet you’d be surprised at what you’d hear. I bet most would tell you that obtaining it is not as hard as you’d imagine, if you were to simply focus on whatever it was you desired to accomplish- be it in sports, business or any other area of life. And if you focused on it at the expense of everything, and everyone else in you life –your wife, your children, your friends, your health– then you could almost guarantee realizing your goals. That’s the way it happens, more often than not. To me, that answer is achieving a healthy balance of overall physical and emotional wellness; of being loving, kind and compassionate; responsible to those who depend upon you; and respectful to everyone else. How often do you see marriages fail, families fractured or children cheated out of having their biggest fans at hand when they take the field, stage or just sitting down for dinner? I should probably be careful of being too “preachy” because I know I’ve missed my fair share of dinners over many years in business and certainly can’t claim accomplishments on the scale of an Urban Meyer. That’s the battle that all of us whose role it is to provide for their families, face over the course of our careers. And it is always a tricky balancing act. In a world where success is too often, too narrowly defined as “productivity” in the workplace, it’s easy to overlook the things that provide the most important measures of human performance. The kind of things that don’t fit neatly inside a trophy case. Kelly Slater Wave Company: The Next Ultimate Wave? Safe to say, even if you don’t surf, you know who Kelly Slater is. He’s the world’s greatest surfer. King Kelly. A legendary 10x world champ who even at age 38, in a time when most progressive surfing is regularly performed above the wave, has somehow remained fit enough and good enough to routinely beat surfers years his junior, from all around the planet. And now the greatest surfer in history wants to build the best wave in the world. It’s an interesting prospect, only because it comes from someone whose understanding of the ocean and the sport are second only to his determination and will to succeed. I remember seeing Kelly surf in person on a road trip to Sebastian Inlet back in my early twenties. Kelly was just 14 at the time and already getting national attention. He was there for the ESA Regional Championships. We just happened to arrive in time to catch the Superheat, where the winners of each division compete against each other in a final, decisive high-performance session to see who is the best of the best. Kelly had already won his division and was surfing against several older, more experienced men. 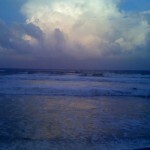 There was a northeaster blowing and the waves at Sebastian were large and sloppy, far from ideal conditions. But let me tell you, when Kelly dropped in, he made every wave look flawless. Not just good. Not just great… but jaw-dropping, “OMG, can you believe that?” otherworldy good. And everyone on the beach that day recognized it. He surfed fast, fluid and stylish, blasting every sliver of open face, effortlessly connecting beautiful maneuvers while intuitively navigating every tricky section. It was clear, even back then, that he wasn’t just a natural. He was supernatural. Today, as freakish as 10 world titles sounds, it doesn’t surprise me. He’s just that good. I consider myself fortunate to have been able to follow his career through my own lifetime, because I don’t expect his accomplishments will ever be matched. This is also the reason I won’t summarily dismiss his vision to build the world’s first natural, deep-water world-class wave. According to a press release, the Kelly Slater Wave Company will use “pioneering wave generation and control technology to create the wave on the outside of a large circular pool, propogating onto an inner island where it breaks endlessly.” Slater suggests that the wave, inside a planned surf park with beaches, restaurants, bars, pools, conference facilities and retail will come close to reproducing the “natural”feeling of one of the world’s best waves. A few years back, I had the opportunity to surf Disney’s Typhoon Lagoon with just a few friends after the park had closed for the day. The waves there seemed to start with 4’ peaks that quickly receded to 2’ lines that weren’t endless. While reasonably fun and consistent, between the stadium lights; eerie sounds of the hydromechanics; soft, punchless waves and chlorine smell, the experience was far from natural. Even if Kelly’s engineers have devised a way to double the size and power of the waves, there are some things about surfing that simply can’t be duplicated by men, even supernatural ones. The inconsistent nature of swells that makes chasing them so exciting, and an integral part of the surfing experience. The unique characteristics of individual waves that allow us to enjoy a variety of experiences on each and every one we ride. The subtle risks of dangers like shallow reefs, clean-up sets and sea creatures we can’t always see, that open our adrenal glands to their addictive flow. The infinite beauty of God’s handiwork, which varies so dramatically from ocean to ocean, beach to beach, break to break, right down to the locals sitting next to us in the lineup. Of course, I’m sure Kelly already understands all this better than most. So, I won’t do the easy thing which would be to scoff at his vision; dismiss it as idealistic; unrealistic in this uncertain economy; or opportunistic at the expense of “surfers” from places like Indiana or Ohio, who only understand surfing through movies like Point Break; magazines like SURFER; and the big brand surf tees they buy in their local mega malls. They deserve to experience the thrill and joys of surfing as much as any of us. To learn more about the Kelly Slater Wave Company, visit Slater’s YouTube Channel where he shares more of his vision in a series of videos. The 2010 Winter Olympics are behind us and I for one am sad to see them go. There were so many compelling moments that defined the Vancouver Games for me, from snowboarder Shaun White’s incredible Double McTwist 1260 in the half-pipe (a trick only he can perform); to Apolo Ohno passing the Chinese team in the anchor lap of the 5000 meter short track relay to become the most decorated American in Winter Olympic history; to the final frantic seconds of regulation and overtime in the US–Canada gold medal hockey game. But nothing brought me to edge of my seat like Lindsey Vonn and Bode Miller’s exhilarating performances in the men’s and women’s downhill. What I love so much about all of our Olympic Athletes and find so well-exemplified in these two in this event, is their absolute understanding and embracement of a simple, but profound principle, one I believe creatives should never forget: That distinguishing achievement often requires more than talent and training; more than skill and desire; more than preparation or luck. It most often requires exceptional courage and a willingness to take extraordinary risks. And that’s not easy or natural for anyone. Vonn would later state that this simple, strategically calculated message from her husband allowed her to “focus on that challenge” and “let go of her fears”. She subsequently took the most aggressive lines all the way down the mountain, coming perilously close to wiping out at nearly every turn. The result: she beat Mancuso’s “sepcial run” by over a full half-second. I believe creatives from designers, to copywriters, to marketing strategists should take the same approach as Miller, Vonn and others and not allow themselves to be constrained by fear. I appreciate creatives who are willing to explore their most conceptual ideas, even if it results in more misses than hits. I know that doing so will give them their best chance to come up with something great, which is the only thing I ever want to present to a client.Great creative work must always take a point of view. It has to have “something to say” to be memorable. Remember that people respond to “different” and “unpredictable”. In this sense, “safe” is risky. The real problems begin when fear- the fear of mistakes, the fear of looking foolish, the fear that someone won’t “get” your idea, prevents you from saying anything at all. I once heard Jeff Kling, ECD of Euro RSCG put it this way: “Screw-ups are tools of evolution. They help us survive.” There’s a lot of wisdom in that statement. Remember also that in the business of marketing and advertising, we’re not looking to connect with the 80% of people who may not “get”, like, or even care about our creative, but rather the 20% who do and are inspired to act upon it. So the next time you’re faced with a daunting creative challenge (or business challenge, or life challenge), don’t allow yourself to become compromised by fear. Rather, recognize that most of life’s rewards do not come without risk; that we all fall down sometimes; and that even those instances leave us better prepared to make some truly extraordinary runs in the future. If nothing else, we’ll put people on the edge of their seats. At least for marketers, that’s our job. I’m guessing that somewhere out there, perhaps on Facebook or maybe inside the Apple Apps store, there has to be a music application that allows you to list all of the concerts you’ve ever attended. Maybe it does something fancy like allowing you to pull corresponding album covers or band logos into your list, along with the date of the events; concert venues; friends you went with; and the opportunity to upload photos or videos from the shows, and perhaps some notes. If such an app doesn’t exist, then someone should promptly develop it (I’ll take a 15% cut on revenue for the concept, and the rest is yours). Or, perhaps if I have time one day, I’ll investigate it further and if I can’t find anything similar, we’ll develop it ourselves at Renaissance Creative. Regardless of whether such an app currently exists, I’ve always wanted to create one of these lists for myself. 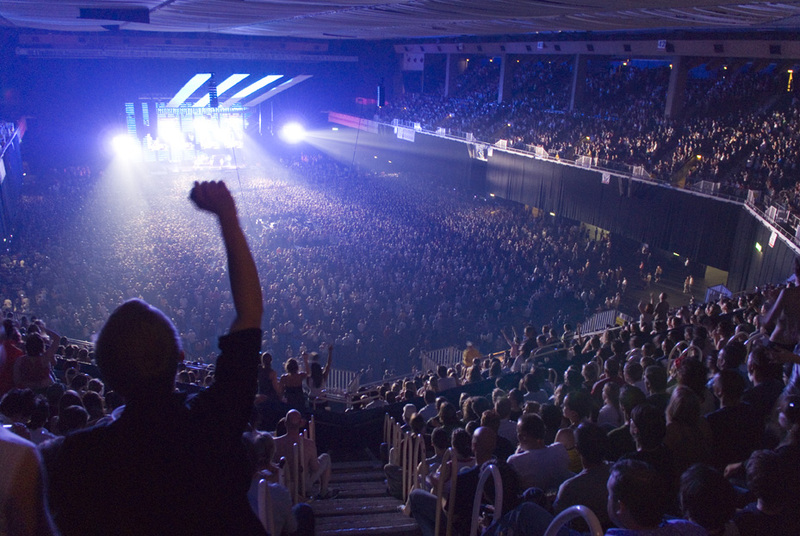 I’m a huge music fan and I’ve seen a pretty fair number of concerts in my time ranging in genre from Rock, to Rap, to Country, to Punk, To Pop, to Reggae, to Christian and so on. In addition, I’ve been fortunate in my time, for my age, to see some truly iconic acts, such as Elvis Presley and The Clash, to name two. So, I’m going to go low-tech here and just make a list. There’s no way I could ever recall exact dates, nor the names of the specific venues (though I could probably recollect all the cities), so I won’t even try. I will try to list them chronologically, generally– as best my memory serves. I’ll also include notes on interesting facts about shows that merited it. I have a feeling I’ll be updating this post from time to time, as I recall additional shows. I’ve already been writing it for two days. Elvis Presley – 1977, just a few months before he died. My first concert (with my parents and grandmother), at age 13. I was so embarrassed to be there… until he sang. He had an incredibly strong voice and I was pretty blown away. I went on to become a big fan. Still am. John Denver – 2x with parents. Still a big fan. Van Halen – David Lee Roth got so drunk drinking Jack Daniels from a bottle that he forgot the words to the songs and had to stop (singing, not drinking). U2 – Touring behind their second album, War. The Clash – So thankful I got to see this band at an outdoor venue in Daytona Beach before they broke up. They were incredible! David Bowie – So awesome. Another cherished claim. Hoodoo Gurus – I did not miss the rare opportunity to see this iconic Australian surf band right here in Jax. Michael Jackson / The Jacksons – 1984. He / they played 3 consecutive shows in the old Gator Bowl (now Everbank Field), with 136,000 tickets sold at the peak of his career. I went for the sheer spectacle. Tommy Tutone – The former bassist lives down the road in St. Augustine and work at The Surf Station. I saw them at Grad Night in Disney World. Joe Jackson – Front row center in Miami. My friend Danny knew someone. The The – 2x One of my all-time favorite bands. I plan to write a separate post for this still undiscovered and underrated group (Actually solo performer, Matt Johnson). New Order – Disappointing live. UB40 – Also disappointing live. INXS – Brilliant when Hutchence was alive. I would love to see where they would have gone with him. Social Distortion – 2x, Loudest Concert I ever heard. My ears were just ringing. I know I lost hearing there, but they were fantastic. Nine Inch Nails – 3x. I met Trent Reznor personally, who actually dated and lived with my ex-girlfriend, Beth Narducci, for a couple of years in New Orleans. Nice guy. Humble and unassuming. I’ll write a separate post on that sometime. Ministry – Saw them in an industrial warehouse, a perfect setting. Exhausted, I tried to climb out of the mosh pit, but was thrown back in by some punk grrrrls. Thought I was going to suffocate. Adam Ant – Another performer I’m so glad I got to see. The “Bad Boy” Brit rocked a little bar in Orlando. Two drummers. Played all his hits. It was great. Sublime / Long Beach Dub All-stars – One of my all time favorites, but I missed the opportunity to see them with Bradley Nowell (Was invited and urged to go by a friend). I hate to see such gifted souls lose themselves to drugs and other demons like that. Chris Issak – Great performer. Talented musician and fuuny. Love all his stuff. The Cult – House of Blues. Small venue, great concert. Elvis Costello – He’s a hero of mine. Intelligent. Original. Diverse. Passionate. Saw him at the Hard Rock Café in Orlando. Jimmy Buffet – 3x I love Buffet. His concerts are getting older and “grayer”, but he is pure “escapism”, which I respond well to. Eagles – Great band. So many songs. Beach Boys – Older, but what amazing voices and tunes. Lloyd Cole – Perhaps you’ve never heard of him. If not, you should learn more. I did a blog post on him, here. I can’t believe I was able to see him live in a small Jacksonville bar, just a few feet from him. An incredible show! Wiggles – Umm… parents will know who they are. Third Day – I went from Ministry to Third Day! I love music of just about very variety. Occasionally, I hope to use this blog to introduce readers to some of my favorite artists that they may not be aware of, or performances they may enjoy. One of my long time favorites is singer/songwriter LLoyd Cole. Lloyd Cole and the Commotions debuted in 1984 with their album, Rattlesnakes, that reached #13 in the UK on the strength of the singles “Perfect Skin”, “Forest Fire” and the title song, “Rattlesnakes”. Over the next five years, they would put out two more albums before breaking up, when Lloyd began pursuing a solo career. Lloyd is one of the most talented, intelligent (his songs contain many literary and pop culture references) and stylish performers you’ll ever see, respected tremendously by his industry peers. Like Prince, he is a prodigal guitarist and recorded many of his songs in his home, entirely by himself, playing every instrument. His music is largely alternative pop-rock, with an acoustic/folk sensibility. Unfortunately, judging by his Youtube numbers, which range from just a few hundred to about 15,000 views or so, today’s generation is either disinterested or has yet to discover him. I was fortunate to see Lloyd Cole live in a very small bar right here in Jacksonville just a few years back. I considered it a once-in-a-lifetime opportunity and was able to stand and watch the show with my wife just a few feet from him. It was incredible and believe me when I tell you, I’ve seen a lot of concerts. I’ve posted two clips for you here, both from another one of Lloyd’s concerts back in 1990. These songs (“Jennifer She Said” and “Brand New Friend”), aren’t his most recognizable hits, but some of his greatest, nonetheless. Ignore the cheesy stage lighting and just pay attention to the music. Better yet, ignore the video and just turn up the music. If you’d like to sample more of Lloyd Cole’s music, know that his are the types of albums that can be listened to straight through with great enjoyment of every track (they are first-rate ambiance for house parties and road trips- your friends will want to know who’s playing. ).That said, this Greatest Hits album is an excellent place to start and can be had for just $7.99 on iTunes: http://itunes.apple.com/us/album/lloyd-cole-commotions-1984/id14321168. While his history is long, rest assured that Lloyd is still cool, still relevant and incredibly, still underrated and undiscovered. Skateboardanimation by Tilman Singer on Vimeo. Beautiful. Props to Marc Rapp for discovering and sharing this beautiful work on his Uniquely the Epitome blog. Marc’s one of the most talented designers and interesting people I’ve ever met and his blog is a place that is always packed with strong opinions and fresh ideas. Big wave surfing at Shipstern’s Bluff. I’ve traveled to a lot of places for waves, but have never made it to Australia or Tasmania, an Australian island and state, where this wave is located. It’s hard to believe people paddle out here and live to tell about it. It does look fun though, in a very sadistic sort of way. 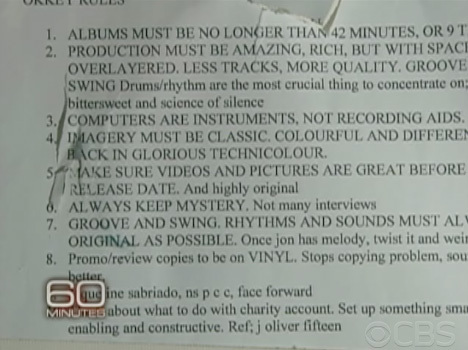 These are Chris Martin’s notes to himself and his bandmates, one of many such items posted on the walls, a whiteboard and even Martin’s studio piano (he scribbles on it in green marker). More precisely, these are reminders of key principles which have helped Coldplay become astoundingly successful- a “secret formula” if you will, of philosophical beliefs and strategic tactics that the band employs consistently, covering everything from song construction; to photo / video guidelines; to marketing and public relations positioning; and general business. In the interview, news journalist, Steve Kroft, framed Martin’s practice as somehow aberrant, stating: “He is a compulsive worrier and list-maker. He sends himself electronic messages, and scrawls notes on scraps of paper, on his hands, and anything else that’s available, lest he forget some brilliant idea. Like many artists, he is openly, gloriously neurotic.”“Neurotic?”I call it pure business acumen- (beautifully) equal parts creative and analytical. How many new ideas or profound realizations arrive for many of us at unexpected moments? Insights that you just can’t afford to forget? What do you do? Grab a pencil and jot ‘em down, of course! Most designers I know keep idea/sketch books handy and I’ve got plenty of notebooks and post-it notes full of marketing, design, business and leadership lessons that I’ve either come to realize myself, or have picked up from others much wiser than me. And so on.I keep them where I can always be consciously reminded of their powerful truths. If you happen to be the kind of person who instinctively organizes your standards and observations into digital files- congratulations! If you prefer a bulletin board, whiteboard or post-it’s, I can relate. If you use a green sharpie on your white grand piano, then ummm… well, o.k…. maybe Martin is a little bit more obsessive than most.But, based upon what I can clearly see in Chris’ notes, he is a man that is more calculating than confused; more cognitive than compulsive; more analytical than anxious. I see someone who is introspective and intelligent, and not inappropriately impulsive. Creatives, take note. 4. Imagery must be classic, colourful and different. Come back in glorious technicolor. 5. Make sure videos and pictures are great before setting release date. And highly original. 7. Groove and swing. Rhythms and sounds must always sound as original as possible. Once Jon has melody, twist it and weird it. Last night I was channel-surfing and came across a teriffic PBS special- a White House tribute to Sir Paul McCartney (actually a repeat from earlier this summer). President Obama was presenting the former Beatle with the prestigious Library of Congress Gershwin Prize for Popular Song. The event was quite formal, with a restrained air of dignity and sophistication and a few sublime performances from such entertainers as Elvis Costello and Emmylou Harris, who all sang covers of various Beatles / McCartney songs. One really special performance was “Band on the Run” by Dave Grohl, former drummer for Nirvana and current guitarist and frontman for the Foo Fighters. What I loved so much about it was that, well– he rocked his arse off, just like he always does! Never mind that President Obama was a few feet away, along with a stiff mix of seniors, suits and politicians that had likely paid thousands of dollars for tickets. Grohl blew the doors off the song like he was playing Lollapalloza, or an LA bar or something. Killer riffs. Hair flying. Ears ringing. It was great, and you could tell that McCartney and everyone else really dug it. I know I did. It was also a great reminder of what a versatile performer Grohl is and what a really talented songwriter McCartney is. Here’s the vid. Enjoy! Yesterday afternoon, I attended the memorial of friend and business associate, Stephen George William Parker. Stephen lost a year-long battle with cancer last Sunday. He was only 46. A large group of family and friends gathered to celebrate his life under an ocean pavilion at the St. Augustine Pier. 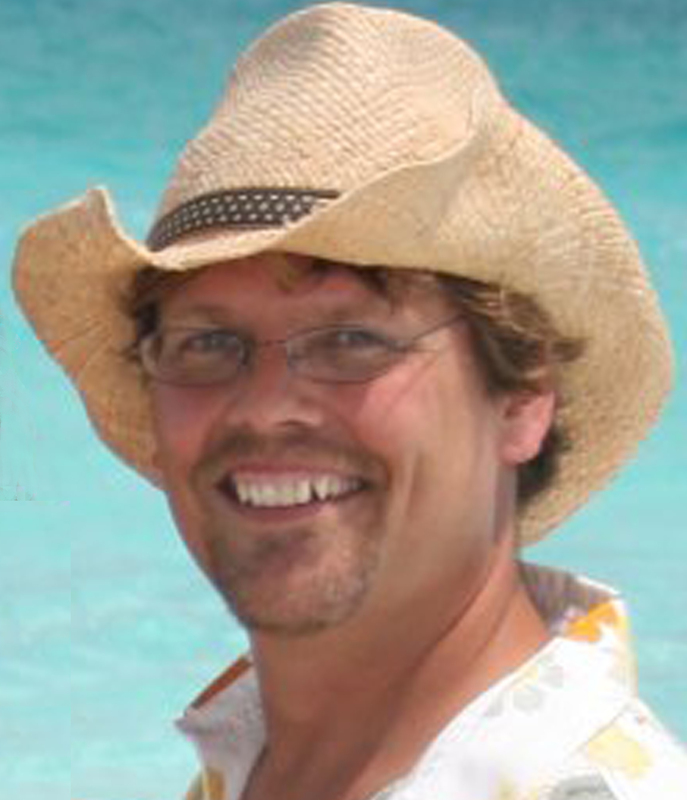 When my day comes, I’d like to be remembered exactly as Stephen was– with warm ocean breezes, good food, cold beverages and a live band, along with a low-key slideshow and a few heartfelt remembrances from family and friends. For those that didn’t know Steve, he was a kind and generous guy– always quick with a smile and a wry remark, often laced with a little self-depreciating humor. He loved traveling, music, the ocean and his family- including his wife, Cindy; their two daughters; and his three brothers, with whom he was very close. Like many of us here in North Florida, Stephen was a survivor of the real estate market meltdown. He was Vice President of Parker Associates, a real estate development / and marketing consultation firm where he shared duties with his father David, and older brother, Chris. From Florida, to Costa Rica, to Russia, if you wanted to know what to build upon a certain piece of property; how to position it; price it; and market it; then these guys could tell you. Their endurance through the market turmoil is a testament to their expertise and professionalism. With markets still trying to find their way forward and property changing hands, their insights today are more valuable than ever. As many from Jacksonville (we, who lived “inside” of one of the nation’s largest real estate bubbles), will tell you, the battle back has been long and arduous. And while Steve and his family have overcome incredible challenges that saw so many other real-estate related companies fail over these past 2.5 years, the merciless serial killer that is cancer came along and buggered up the victory celebration for all of us. Or perhaps I should say, “almost all of us”. Not for Stephen, himself. You see, what those closest to Stephen reassured us was that he passed away with absolutely no regrets. He never waited for life to “happen” to him, but always “attacked” it with gusto. If there was a place he wanted to visit, but he didn’t have the funds, he’d find a way to get them. When there didn’t seem to be enough hours in the day for the business at hand, he’d still find a way to get the job done and do so without sacrificing time for his family, friends or even just acquaintances, who he always made feel important. To me, achieving this kind of balance is what defines a “successful” life. Today more than ever, it is easy to lose sight of the immeasurable value that each day holds and the pricelessness of the people we spend those days with. Our family. Our friends. Our co-workers. Yes, we face a challenging economy and uncertain times. Yes, technological evolution has enabled, and as a result, required us to fit more tasks into fewer hours, often for less money, raising the bars for efficiency and production to ever higher levels. But at the end of each day, or more appropriately, at the beginning– we owe it to ourselves to pause and reflect on the things that truly matter in this life. We are not guaranteed tomorrow. We are not even guaranteed our next breath. So, if you wish to live a life with no regrets, the kind of life that Stephen George William Parker lived, then don’t wait on it to come to you. Go out and grab it. At home. At work. On the beach. And remember to always do it without losing sight of the important people around you. You never know when they’ll be gone. Steve, we will miss you.